When we write an article or a research paper, we usually take an idea from another author’s work to make our writing richer and better. We also do this to prove or support a viewpoint. This can be done in two ways: by citation or quotation. Many people confuse between the two terms; whereas, others assume these to be the same. But actually, they are quite different. A citation is using a particular idea you get from another author. You don’t need to use the exact words in this case. You can just write the summary or the idea of using your own language. It is also called paraphrasing. Quotation, on the other hand, is the exact words of the other author that you will mention in your own writing. Here we are going to look into detail how citation and quotation defers. When you are writing about something and you want to make your point stronger then you refer to some earlier text that had been written by another author on the same topic. When you decide to quote someone else, you should use the same words and punctuation marks from the beginning to the end of the sentence. You should reproduce it word by word and include quotation marks to emphasize your point. For example, we often quote Shakespeare or other famous writers on our writing because their viewpoint has already been proven to be authentic and it will strengthen our writing. It is another way of writing from another source to support your viewpoint. But in case of a citation, you don’t need to reproduce it word by word like in quotation. You can simply write it in your own words and you won’t have to use the quotation marks as well. You are just going to mention what some other writer has written about the same topic to support your writing and make it more authentic. When you use citation on your writing it is the viewpoints of those who are considered to be the authority in the topic or field you are writing on. For example, when you are writing about technology, you will probably cite something Bill Gates has said. 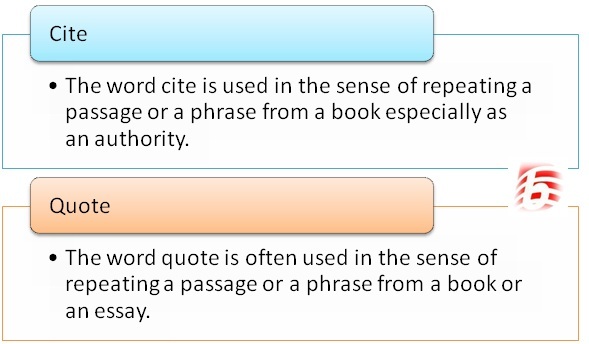 When you use citation and quotation on your writing, you have to follow a particular referencing style. There are tools available that will help you to write in that particular referencing style. For example, if you are using Oscola referencing, then you can use the Oscola referencing generator is the perfect tool to create and format your citations. All you need to do is write the details of the source you want to cite and the generator will cite it in the Oscola referencing style. Therefore, summarizing, quote is to repeat someone’s words exactly the way it is printed. The words are usually from a speech, essay or research paper. These words are written within quotation marks. When you quote, you need to cite the source of your information. Citing, on the other hand, represents the idea or theory behind the quote and not the exact words. You should be careful and write the exact format when you are using citation or quotation in your writing.